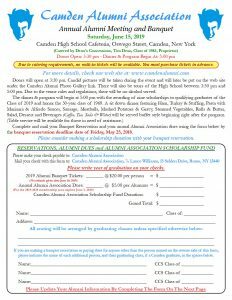 The reservation form for the Annual Alumni Meeting & Banquet has been posted online and available for downloading. You can download your copy today at this link: Annual Banquet Reservation Form. If you have an email address on file, you should have received the first email for downloading this invite. A couple more will follow in the coming weeks. If you are a currently active dues paying member with no email address on file, you will get a copy of the printed banquet information via First Class Mail that will be mailed out the week of April 15th. If you are not an active dues paying member, but you are a member of a class of 1969 or older, the classes of 1974, 1979, 1984, 1989, 1994, 1999, 2004 or 2009 or had paid dues in the past five years and have a valid USPS mailing address on file with us and do not have an email address, you will get a copy of the printed banquet invitation in the mail via non-profit standard mail (reduced postage rates) that will be mailed the week of April 15th. Starting this year, and the reason for the early first emailing, is a new effort to reach all the selected groups, those who fit the groups above that have not opened the first email within a week will also be selected for the postal mailing groups above. 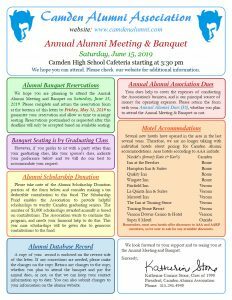 If you wish to update your contact information to be sure you will receive either the email or mailed copy of this banquet invitation and future alumni communications, you may update your information by CLICKING HERE. This entry was posted in General News by Lance Williams. Bookmark the permalink.